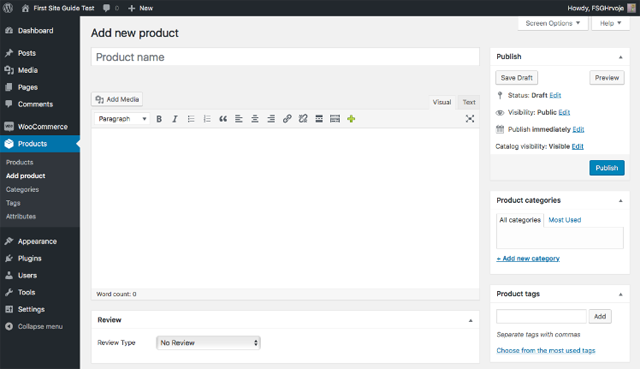 WooCommerce is free, open source, e-commerce plugin for WordPress that comes with a variety of design themes. It is designed for all web shop sizes, from small to large, with virtual, real goods or services. 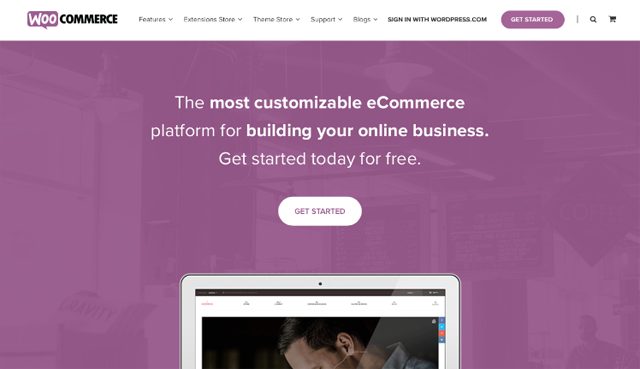 It all started in 2008 with WooThemes, but over time, or to be more exact, since 2011, when WooCommerce was launched, it took over its parent. Today it is a platform that powers 28% of all online stores, and that is not a little feat. But was this shift a good thing or did it complicate things for those that were just looking for simple WP premium themes? Let’s find out. The process of setting up is really easy and you will be lead by the WooCommerce helping hand all the way. It was quick and the only thing that will take you a lot of time to do is the filling out of your virtual store. But let’s not get ahead of ourselves. First, out of seven steps, you will have to do is connecting your WordPress.com account. Then you will be lead through several questions that will help you to set up your online store. After filling that out, and the most important one is, of course, payment methods, you will be taken to the new page that has a wall of text to read. You can just click in the lower right corner on the Install Now button. After that you will have to wait a few moments for them to do their magic and you will be taken to your WP panel, ready to get you through adding your products to your store. With helpful hints, you will get your first product up and on display in no time. If you have ever worked with WP, WooCommerce plugin will look quite similar to publishing your post on your blog, which is great since you won’t need to learn new tricks, just adjust your knowledge a bit. 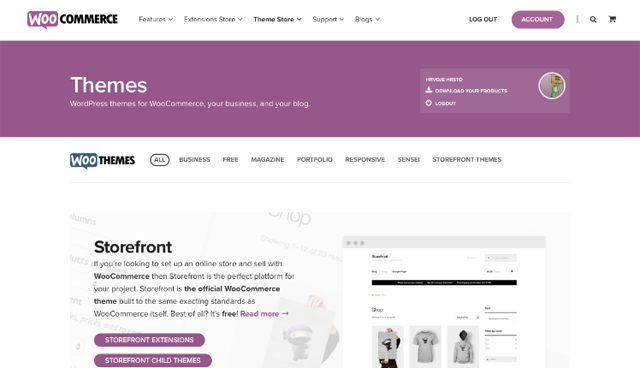 As we already mentioned, WooCommerce integrates seamlessly with existing WP framework. It just adds a new plugin that is updated and maintained with the latest WP versions fairly quickly. 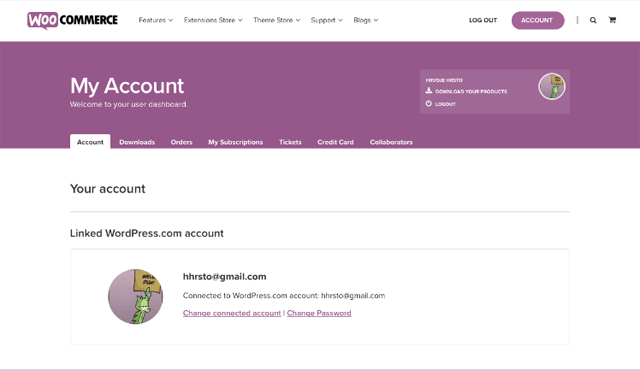 If you want to buy additional extensions that you could use for subscriptions, bookings, memberships etc, you can do it from the WP panel and you will be taken to WooCommerce store. Price will vary from extension to extension and for how many websites do you want to use them. With subscription purchase, you will get 1 year of updates and support. Since their flagship products are free, these can seem a little expensive but do not worry, everything has a live demo that you can try out. We played with their flagship Storefront theme and you can either buy it (for free) on their page or install it directly from the WP panel. It is pretty basic and it will allow your products to take center stage. However, if you want to customize it, you will have to work with the basic WP framework. There is no native builder (although they are compatible with few third party builders) and if you want to start from the scratch with WooCommerce you can play with Canvas template. However, it is not the most user-friendly for customizing things. It does not drag and drop or even split screen. On the other hand, it is not a coding sandbox. It is just old fashioned “punch in the value and visits the page to see the results” type of customization. That can be tricky if you like to play and see the results and do not have final results in mind. However, it gives you a lot of customization options. If you want more WooCommerce extensions, you will probably have to pay for them. Some, mostly third party solutions like Paypal are free, but other solutions, like Stripe, are probably gonna cost you. And that is ok because they do come in bundles and they are integrated with the rest of the framework beautifully. And the best part? Every design and element are responsive. So there is no extra work for the mobile versions of your website. But in the end, all of their products are as they are. Customization is somewhat available, but it is not encouraged. But with things like one-page checkouts, which is often considered an advanced feature, your customers will have an experience that can be compared to smooth sailing. Wo while you might have to work a bit more in some areas, your clients won’t. And we can stand behind that. There are 31 themes to choose from. Some might say that this is a downgrade from their WooThemes days when they boasted 100+ themes, but in the process, they did get rid of a lot of outdated themes. Now only most stylish and up to date themes prevail, which is quite OK with us. Their flagship themes are Storefront and Canvas. First, lets focus a bit on Canvas. It is their most customizable theme. It will allow you to play with almost anything from design, layout, and typography. Its name really gives away its purpose. The storefront is maybe a more famous one, especially in the e-commerce world. Also, themes that are on the cheaper side of things are usually child themes of the Storefront theme. If you are not sure what a child theme is, it is a theme that inherits the functionality and styling of the parent theme, in this case, Storefront theme. If you modify a theme directly and it is updated, then your modifications may be lost, but if you use a child theme your modifications will be preserved. However, that means you will need to install the parent theme before proceeding with the child theme. The only two themes that are cheaper but not Storefront child themes are Forefront and Inspiration Laboratory. Besides the basic online help database, you will have a ticketing system that is divided into tech and sales divisions. If you want support from their team, you can contact their WooExperts, but they have only one team that will do that for free. There are a lot of outsourced teams that will need to be paid for their services, and we are not sure that that is something we are on board. Sure, those are located all around the globe and you can get a real personal assistance, but outsourcing always seems a little bit out of place. However, we do not have any other complaints. There are a lot of user-friendly tutorials but the lack of official community (you get access to official forums after first purchase) and live support is something we really miss. 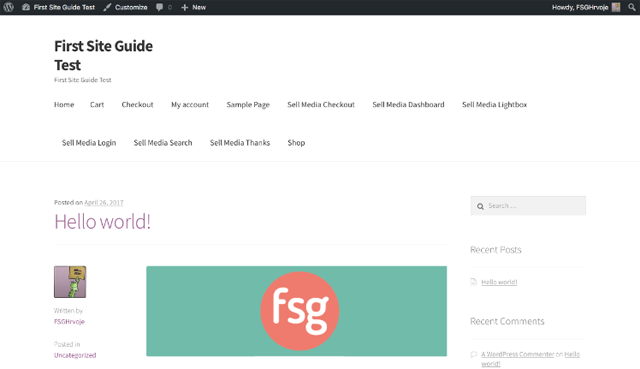 WooCommerce plugin by itself is free, so if you want to set up the store within your existing WP website, you can do it without spending any money. If you want to invest into custom theme store there are a couple of options and they all come with 30 days money back guarantee. The first option is buying a theme. From their free themes pricing goes up from $39 to $139 depending on the theme. You can also pick Standard or Developer Package. Standard package comes with unlimited domain usage and 1-year support and updates. Developer package adds Layered Photoshop PSD. Their only highlighted and the most customizable theme is Canvas, which will allow you to customize enables you to modify the design, layout, and typography of most elements in the design. It comes in Standard package for $99 or Developer package for $119. Lastly, you can get all of their themes in All themes package for $399. It will give you unlimited domain usage, 1-year support, and updates and Photoshop PSD. 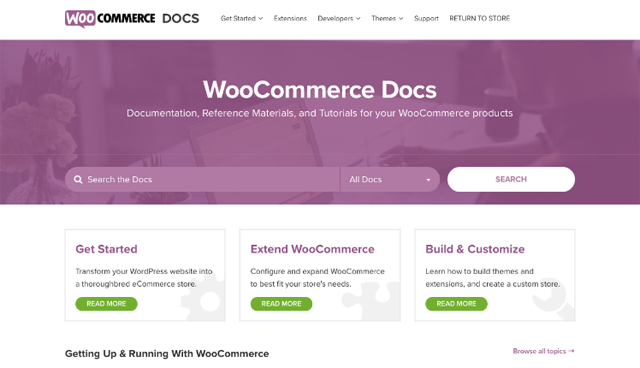 WooCommerce is a great product, but it will require some work on your part. While it will give you full control over your store with some greatly designed themes, you will have to be somewhat experienced in WordPress to get the hang of it. It might not be the most intuitive e-commerce solution out there, but the end results for your customers are always beautiful and really easy to use. While there are some hidden expenses via some plugins that will cost you. But even with the all slightly bad things we mentioned, there are a lot of great sides and it is a favorite among e-commerce developers and designers with a reason. It is robust and best WP integrated solution out there and if you are on a budget, you can use one of their free design themes, mainly Storefront. So if you are already WP user we encourage you to try it out. If not, you might find something more suitable for your needs.